China is immensely and justifiably proud of its long history. A continuous Chinese culture has been in existence since earliest times; it is the only civilization that can make such a claim. Many European archaeologists have sought to trace early Chinese civilization back to a common origin with that of the Babylonians and Egyptians. Their search has failed and so Chinese culture is believed to have sprung up entirely independently close to the Yellow River. Archeological discoveries (e.g. early human finds at Yuanmou in Yunnan) take the story back as far as 1.7 million years. The uncovering of Peking WG Man (Homo erectus) at Zhoukoudian near Beijing affirms human habitation 0.5 million years ago. When it was found in 1920s this was taken as the early progenitor of all the Chinese people; however, further studies have shown that like all other modern humans they are descended from Homo sapiens in Africa. Finds at Banpo village near Xian have identified a Yangshao culture ➚ at 4,500BCE which was followed by the 3,000BCE Longshan culture ➚. The Yangshao villages used stone tools and fished with bone hooks along the Yellow river valley. They left behind distinctive pottery, using, for some of it, a potter's wheel. The weaving of cloth had also started. The upper reaches of the Yellow River, fed by melting ice, are less prone to flooding than downstream. Here the Yellow River provides a dependable source of water to irrigate the fertile loess soil which is easy to work with antler and stone tools; and so the location was ideal for early agriculture. As in the Nile river valley, reliable annual crops led humans to settle and form fixed communities rather than live as wandering bands of hunter-gatherers. The whole country at this time was dominated by vast forests with elephants; tigers and rhinoceroses roaming the woods. 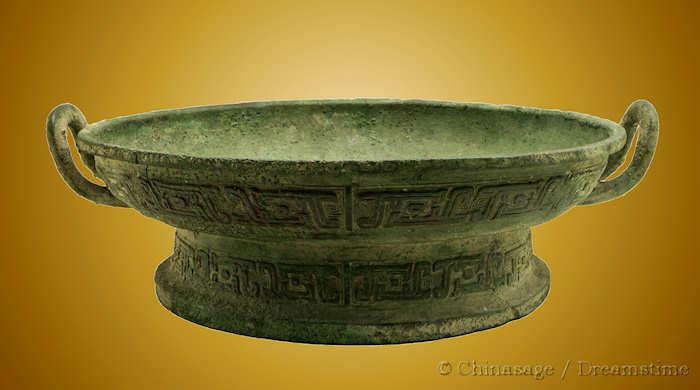 By 5,500 years ago the Hongshan culture in Liaoning had already begun to produce fine ornaments made from jade. In other areas of China, other cultures developed independently with very different traditions. For example the Sanxingdui culture ➚ (2800-800BCE) in Sichuan produced distinctive bronze heads. Cultivation of rice began as early as 7,000 years ago in the lower Yangzi River valley quite separate to the north. Extent of Neolithic finds in China with the location of the major settlement sites. Teacup media audio podcast by Laszlo Montgomery. During this time period the Chinese system of writing evolved from a few simple pictorial characters to the rich script of the Qin Dynasty. Although accurately kept historical records push back China's documented past a long way, there is a point when fact and legend inter-mingle. In the case of Britain the 'legendary' era survives as recently as King Arthur in the 5th century CE, whereas in China you need to go back a further 2,500 years to the time of the Yellow Emperor ➚ c. 3000BCE , the founding father of China. There is a traditional continuous line of all the Kings and Emperors of China going all the way back to him. 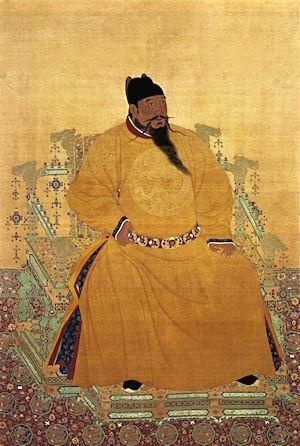 The Yellow Emperor is the last of three sovereigns (三皇 San Huang 'three august ones') of a legendary demi-god status; the list of which three sovereigns are included varies between different historical sources: Fuxi 伏羲; Shennong 神农 (god of farming); Zhurong 祝融 (god of fire); Gonggong 共工 (god of water) and Suiren 燧人. Before them there is only the creation myth of Pangu and then Fuxi and Nuwa (his wife or sister) who created the world and people. Fuxi is believed to have brought fire to humans and the domestication of animals among many other basic activities. Most creation myths also include the discovery of yin & yang and then the eight trigrams. 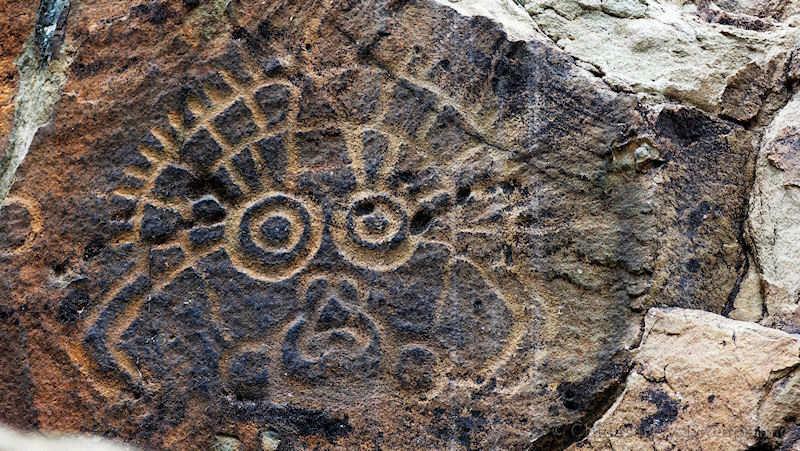 Ancient rock art of the Helan Mountains on the border of Ningxia and Inner Mongolia. Of Neolithic age this carving probably represents a sun god. The Legendary era begins with the five Model Rulers starting with Huangdi, the Yellow Emperor ➚ 黄帝Huángdì [2718 BCE - 2598 BCE] who is credited with inventing many of China's key technologies. His wife the Empress Leizu is said to have pioneered innovations such as silk production. The traditional numbering of years starts at the year of the Yellow Emperor's birth. He is considered the founder of China and all Chinese people claim descent from him. The term 'yellow' comes from the name of the time period in which he lived, each period was named according to the cycle of Daoist five elements and 'yellow' is associated with the 'earth element'. His burial place is reputed to be at Huangling north of Xi'an. He was followed by Zhuanxu; Ku; Yao and Shun according to the Han historian Sima Qian, each is believed to have made some contribution to Chinese culture (tea, silk, agriculture, administration, fishing, weiqi, calendar, Yi Jing, medicine etc.). 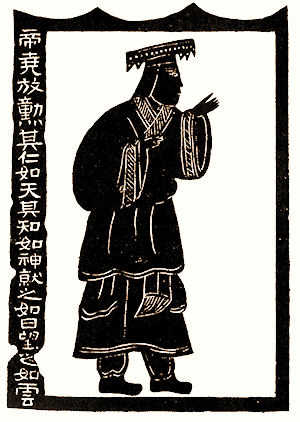 Emperor Yao is credited with devising the calendar and a system of rituals. He is regarded as the Model Emperor against whom all other emperors were measured and found lacking. Confucius frequently mentions Yao as the example of the correct way to rule. Northern China produced pottery; silk and worked with jade (for the manufacture of weapons and ceremonial vessels). Emperor Shun was commended for his care of his blind father; he set perhaps the most important precedent by selecting his successor ‘Yu the Great’ 大禹 on merit rather than by birthright. However, it is inaccurate to consider China as a unified 'empire' or 'nation' at this stage, there were a number of independent kingdoms with little interaction between them; the traditional historical record gives a false sense of unity. A lavishly illustrated delight. Covers all the dynasties in time order with every emperor getting a mention. The most attractive feature are the illustrated panels covering related cultural topics. It is a most commendable factual account of Chinese history. The only things it lacks, may be, are overviews of the time periods and putting events into a global context. As it is titled a 'chronicle of emperors' one would not expect it to cover the lives of ordinary Chinese people but all major developments are covered. Yu the Great's reign, which marked the start of the Xia dynasty, began the recorded history of China. Yu's first task was to repair the kingdom after a great flood, which some have connected this with the Biblical flood of Noah. He is most remembered for his work on flood prevention along the Yellow River. 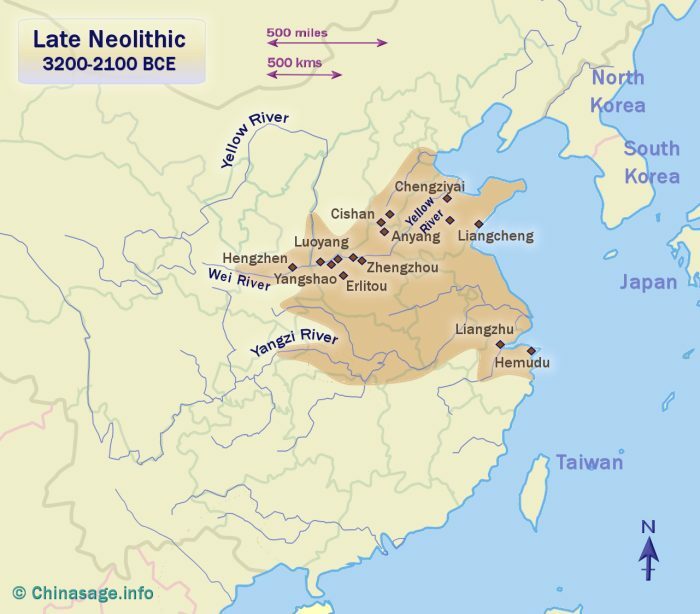 Archeological research has found a number of autonomous communities each developing their own culture and traditions along the Yellow; Wei and Yangzi valleys, rather than a unified nation state. However some of the individual historical events (for example floods and battles) recorded in the ancient texts have been confirmed by archeology. The tyrannical rule of the Emperor Jie of the Xia dynasty led to revolt and overthrow by Cheng Tang ➚ of Shang to found the Shang dynasty. Widespread developments began in economic, political and cultural spheres. The first walled cities were built at this time on a standard grid pattern layout. The capital was first Bo (near modern day Shangqiu) and then Yin (near modern day Anyang) both in Henan province. These cities seemed to have been mainly administrative and ritual centers; they also offered markets to the majority of people who were still engaged in agriculture. Shang China had a feudal economy where the landowners exercised absolute control over everyone in their fiefdom. The nobles lived a life of luxury while everyone else scratched a meager existence. Rule was passed solely through the male line, setting a precedent for subsequent dynasties. Warfare was revolutionized by the import of domesticated horses, making chariots the feared instrument of conquest. Although Shang rule was limited to the Yellow River valley its influence spread to the Yangzi river and along the south-eastern coast as far as Guangdong. Development of the Chinese script continued, writing has survived on oracle bones and bronze vessels. About 1,000 characters of the 5,000 characters used in Shang times are still recognizably similar to those of today. The Chinese calendar system of leap months and ten day weeks was developed. In metalwork, they developed the ability to cast elaborate, massive bronze vessels ➚ which was unrivaled in the world at the time. 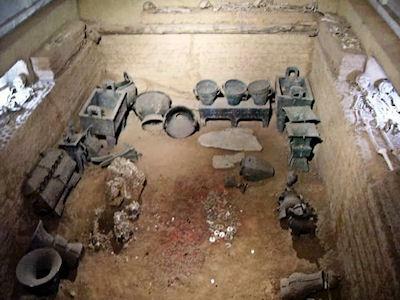 The tomb of Lady Hao ➚, the only intact Shang tomb to survive to modern times shows the sophistication of the culture with a diverse range of ornate objects. Buried with their rulers were their many attendants. Silk production grew in sophistication, although its fragility has meant that, although tools used to make it have survived, no fabric from this distant time remains. China's civilization expanded down the Yellow River to Anhui; Hunan; Shanxi; Hebei and Shandong. Growth was promoted by introducing water engineering for irrigation and flood control. The great Han dynasty historian Sima Qian wrote an amazingly detailed history of this period. As with the Xia dynasty the end of the Shang came with the tyrannical and vicious rule of a ruler, in this case King Zhou (aka Zhou Xin). He led a profligate and debauched life and is noted for filling a lake with wine and devising cruel tortures for entertainment. King Wu of Shaanxi, occupying the Wei valley, overthrew the Shang and established the Zhou dynasty. They were probably outsiders of mixed barbarian (from Gansu province) and Chinese origin. They split the land into 71 fiefdoms for princes and dukes. However it is likely that at this early time each walled town was fairly autonomous with its own ruler. This book by the leading Chinese scholar of his generation turns his attention on the bloodiest Civil war in world history. The infusion of Western religion into CHina had toxic effects in the middle of the nineteenth century. This book details the full history of the rebellion and its long lasting effects on Chinese development. 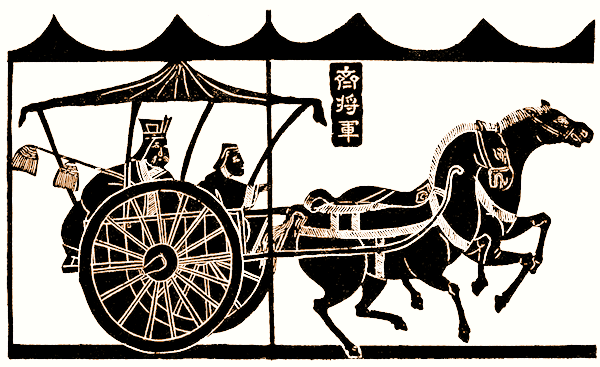 The Zhou dynasty introduced many innovations that have endured for thousands of years. The first three Zhou rulers are remembered for their exemplary leadership and remain admired for their military prowess, cultivation of the arts and unselfish rule. The early part of Zhou rule was regarded as a ‘Golden Age’ throughout much of Chinese history. The post of Emperor had the title ‘Son of Heaven’ (天子 tiān zǐ) and held the key responsibility of maintaining the rituals needed by the heavenly deities. The concept that the emperor ruled with the ‘Mandate of Heaven’ was important as it permitted rebellion when it was judged by the people that misrule or natural disasters signaled Heaven's displeasure and the loss of the Emperor's right to rule. A successful revolt against Zhou Li Wang ➚ in 841BCE attested to this principle. The Mandate is still considered powerful even into modern times; the devastating Tangshan Earthquake ➚ of 1976 was shortly followed by the death of Chairman Mao. Like the Pope in medieval Europe the emperor was considered the primary link to the gods of heaven and Shangdi in particular. During this early period it was common for human sacrifices to take place after troubling events that were considered signs of heavenly displeasure such as natural disasters. Sacrifices also took place on the death of the emperor; with many high officials buried with him; however this practice slowly fizzled out during the dynasty. China (Zhongguo - which can be transliterated as the central country) became a meaningful concept at this time. Even though people lived in isolated small communities there was already a feeling of cultural unity with a shared civilization. The world was envisaged as a series of three concentric squares with the Chinese capital at its center, with the level of barbarity increasing the further out you traveled. It is from this viewpoint that the name for the nation 'Central' or 'Middle' Kingdom originated. Kings of 'tribes' to the south accepted a limited degree of fealty to the Zhou rulers. However most of the cultural activity happened in northern China around the Yellow River with its capital at Luoyang. The nation was surrounded by wasteland, deserts, limitless oceans and barbarians launching frequent raids on the settlements. China began to see herself as the cultural and geographical center of the World. This China-centered view persisted for three thousands years - into the Qing dynasty. In the Zhou dynasty the first walls were built to defend China's northern border; these were later to be joined together in the Great Wall. It is only in the later stages of the Western Zhou that historical records become more consistent and reliable and no longer just tales of the actions of the Emperors. The great capital city of Zhou was at Hao ➚ south-west of modern day Xi'an. After over 300 years, the Western Zhou dynasty was in turn overthrown by the Quanrong ➚ nomadic tribes and disaffected fiefs. The capital city was sacked and destroyed. The son of the defeated emperor set up the new capital further east at Luoyang. This was the start of the Eastern Zhou which is traditionally divided into two periods :Spring and Autumn and Warring States. Emperor Yongle (Chengzu) of the Ming Dynasty, hanging scroll, ink and color on silk, 220 x 150 cm. Located at the National Palace Museum, Taibei. This picture shows him seated on the Dragon Throne. Image available under a Creative Commons license ➚. The Mandate of Heaven 天命 tiān mìng is an important concept running through all Chinese history. The Emperor of China only ruled as long as he had the support of heaven (the realm of the gods). The Mandate of Heaven (another translation is ‘god's will’ or transliterating ‘heaven fate’) was a guiding principle as far back as the Shang and Zhou dynasties. The Emperor was known as ‘Son of Heaven’ 天子 tiān zǐ, the sole human link between Earth and the controlling Heavens above. As the sole such intermediary on the world he outranked all other rulers and this lead to clashes with European rulers who considered themselves his equal. In the early dynasties the possession of nine bronze tripods (鼎 dǐng) was an integral part of the right to rule. Each tripod was said to be inscribed with the map of one of the nine provinces that made up the country. The sign that the mandate had been lost would be made evident by all kinds of calamities including natural ones: earthquakes; storms; floods; famine and plague. Other signs could be a more personal evidence from the emperor's behavior: cruelty; corruption; military defeat and incompetence. These were all interpreted as signs of the displeasure of the gods. To rise in rebellion when these signs occurred was considered justified. A new dynasty would claim their successful seizure of the Imperial throne was a proof of their mandate, because the success of the rebellion was seen as heaven's approval of the transfer of their allegiance. Please feel free to contact us about anything about the Chinasage web site or China in general. Is something wrong? Or is something you want missing? Please let us know so we can put it right. You do not need to supply an email address or register to leave a comment if you do not want a reply to your message. The alternative guiding philosophy of the Legalists and kings in medieval Europe was by divine right. The right to govern was by birthright and could not be challenged; so rebellion could never be justified. The Mandate can therefore be seen as the pinnacle of Confucian philosophy. The ultimate responsibility is the Emperor's duty towards heaven from which all other duties flow. The mandate implies the ruler is the most virtuous person, and will lose the mandate should his virtue weaken. Symbolically this duty included the proper rites at the Temple of Heaven at the start of each year. The emperor would kowtow at the temple to show his subservience to heaven. When China was ruled by foreign people (e.g. Mongols and Manchus) the new rulers needed to prove that they now had the Mandate, and they did this by performing the appropriate ancient rites. If the Empire is rocked by natural disasters or revolts the appropriate response was for the Emperor to admit to his failings and adopt a new reign name, effectively restarting his reign from scratch. The ‘Mandate of Heaven’ philosophy is still evident today. The Communist government of China will be tolerated as long as it serves the people with increased prosperity, should this falter then revolt will inevitably follow as a natural consequence, loyalty to a regime/dynasty is never permanent. Chairman Mao himself is famous for the maxim 'to rebel is justified ➚'. Citation information for this page : Chinasage, 'Early Chinese Dynasties up to 770BCE', last updated 22 Nov 2016, Web, http://www.chinasage.info/dynastyearly.htm.